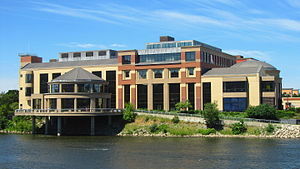 The Grand Rapids Public Museum, located in Grand Rapids, Michigan, is among the oldest history museums in the United States. It was founded in 1854 as the "Grand Rapids Lyceum of Natural History". The museum includes a cafe, a gift shop, and a 1928 Spillman carousel, which is situated in a pavilion over the Grand River. A Wurlitzer #157 Band Organ that plays 165 rolls provides the carousel's music. The Museum building also houses the Roger B. Chaffee Planetarium. The current Pearl Street N.W. location, built in 1994, replaced the former Art Deco location on Jefferson Avenue S.E. ; that building now serves as a High School and community archive. The museum also operates the Voigt House Victorian Museum, located at 115 College Ave. SE. The Voigt house (built in 1896 & last furnished in 1907) was the residence of the Carl Voigt family for over 76 years. Donated to the Grand Rapids Foundation upon the death of the youngest child Ralph Voigt in 1971, the property came into the eventual possession of the museum. The Voigt house is a time capsule to the late Victorian era, having never been remodeled by the family over the decades. An exploration of Grand Rapids' colorful heritage of the furniture manufacturing capital of the world. A 1904 nearly life-size recreation of an allegorical Grand Rapids business district of a century ago. A look at both the ecosystems of Western Michigan along with the history of the museum as an interpreter of the natural world. This alphabet-linked exhibit provides a means to bring out artifacts from many of the museum's collections e.g. "D is for Dolls"
The "Newcomers" exhibition is the most recent permanent exhibition at the Public Museum. This exhibition showcases the variety of ethnic groups that have contributed their unique imprints to the greater Grand Rapids community.